The black 15.6" ThinkPad E590 Laptop from Lenovo is a business-ready system designed with the performance, connectivity, and security you need. Specs-wise, it's powered by a 1.8 GHz Core i7-8565U quad-core processor, 16GB of DDR4 RAM, and a 256GB NVMe PCIe M.2 SSD. Should you need more room, you can attach external storage solutions via its two USB 3.1 Gen 1 Type-A ports, single USB 3.1 Gen 2 Type-C port, and USB 2.0 Type-A port. There's also a microSD card reader available. Its 15.6" display, driven by an integrated Intel UHD Graphics 620 chipset, is built with an IPS (In-Plane Switching) panel and features a Full HD 1920 x 1080 resolution. If you wish to extend or mirror your display, you can utilize its HDMI 1.4b port. Connect to the internet via Wi-Fi 5 (802.11ac) or with Gigabit Ethernet LAN for a more stable and reliable connection. Other integrated features include Bluetooth 5.0, a 720p webcam, a microphone, speakers, an HDMI port, a fingerprint reader, and an audio in/out jack. Included with this laptop is a 65W USB Type-C power adapter. The operating system installed is Windows 10 Pro. The ThinkPad E590's security features help your SMB take control. The optional fingerprint reader adds secure biometric authentication, while the discrete trusted platform module (TPM) encrypts data at the hardware level. 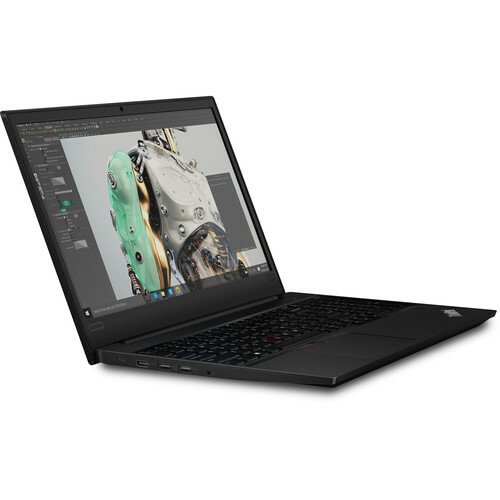 The ThinkPad E590 features an Intel processor and is compatible with optional Intel Optane memory, which means everything's accelerated, from everyday computing and opening media-rich files to loading high-performance games. Plus, with the option of dual storage drives, you can fly through tasks. The ThinkPad E590 is tested against industry-standard quality checks to ensure reliability. The ThinkPad E Series undergo a range of testing including hinge life-cycle durability, fan testing to keep thermals in check, vibration and shock tests for everyday handling and transporting, and even keyboard testing to verify sturdiness and longevity of keys and components. When you buy the ThinkPad E590, you get the perfect blend of value and durability. The ThinkPad E590 features a sleek metallic finish in black. When your meetings take you around the world, you can trust the ThinkPad E590 to deliver superb web conferencing. This business machine features enhanced VoIP calls with an HD webcam, dual-array noise cancelling microphones, and Dolby Advanced Audio. Plus, the ThinkPad E590 is even Skype-certified. Box Dimensions (LxWxH) 19.2 x 13.1 x 3.1"